Swaminarayan Akshardham in Gandhinagar, Gujarat is a large Hindu temple complex inspired by Pramukh Swami, the former spiritual head of BAPS Swaminarayan Sanstha. Located in the capital of Gujarat, the complex was built over 13 years and is a tribute to Swaminarayan and his life and teachings. At the center of the 23-acre complex is the Akshardham mandir, which is built from 6,000 metric tons of pink sandstone from Rajasthan. 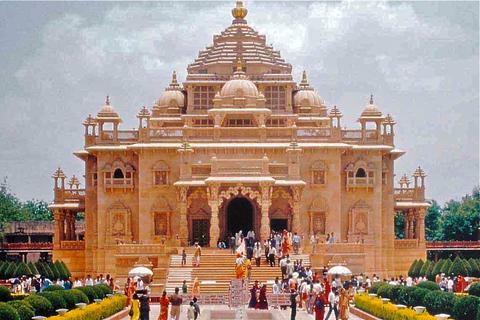 The complexs name refers to the divine abode of Swaminarayan in the BAPS philosophy; followers of Swaminarayan believe that the jiva or soul goes to Akshardham after attaining moksha, or liberation. BAPS followers worship Swaminarayan as God almighty.